Durable Aluminum Alloy Head. 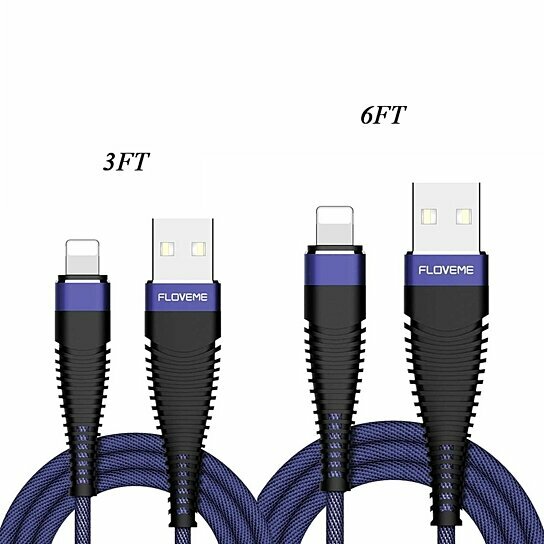 10000 + Plug & Unplug, 5 times longer life span than ordinary cables for cell phones. Fast Charge and Data Transfer. 2A Charging and 480 Mbps Data Transfer. Perfect Compatible for Apple Devices. Support iOS 9, 10, 11. For Apple iPhone X, iPhone 8 / 8 Plus, iPhone 7 / 7 Plus, iPhone 6 / 6s Plus / 6s, iPhone SE / 5s / 5, iPad Air / Air 2, iPad mini / mini 2 / mini 3, iPod. 3.28 Ft (1m) is the ideal length for usage at home, on the travel or in the office. Amazingly Durable & Strong. Phone cable has 5x More Tough Braided cloth. 1000 kg tensile. 2A Charging and 480Mbps Data Transfer at the same time. Braided Cloth Aluminum Alloy Head Sync Cell Phone Cables. Reinforcement Protection Charging Cable. Durable Charger.